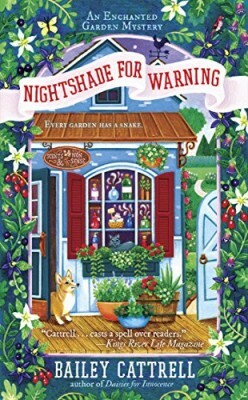 This week we have a great group of new mysteries for your summer reading-A Nightshade for Warning: An Enchanted Garden Mystery by Bailey Cattrell, Every Body on Deck: A Savannah Reid Mystery by G.A. 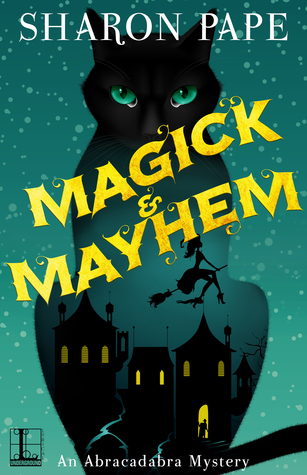 McKevett, Magick & Mayhem: An Abracadabra Mystery by Sharon Pape, and Death in Dark Blue: A Writer’s Apprentice Mystery by Julia Buckley. Details at the end of this post on how to enter to win a copy of all 4 books, along with links you can use to purchase them. Elliana Allbright is delighted to be the owner of the Scents & Nonsense customized perfume and aromatherapy store in Poppyville, California, and she’s just as proud of her charming tiny house and Enchanted Garden next door. So when she learns that Blake Sontag will be in town to interview her regarding clean living and the tiny house craze for “Conscience Magazine,” Ellie is thrilled and scrubbing down her home to picture perfection. Although her fellow Greenstockings businesswomen encourage her to also promote their businesses, the cranky reporter seems to have little interest in either his former hometown or the environmental movement at all. That makes dinner with Ellie’s brother and his new girlfriend Larken Meadows extremely uncomfortable, and Blake’s rudeness has the sincere Lark storming off in frustration. When Blake is found dead in his hotel room, the detective who once tried to arrest Ellie for murder now has his sights set on Lark. Being someone who has a history of protecting her half-brother since they were children, Ellie doesn’t hesitate to again step in to help Colby and prove Lark’s innocence. It seems that Blake had his share of enemies, resulting not only from his ruthless ambition but from land owned by his family. Among the suspects is photographer Tanner Spence, whose resemblance to a Greek statue is proving problematic in the light of Ellie’s very long-distance relationship with her boyfriend. Ritter Nelson has only just begun his six-month long botanical research project in Alaska, but he’s already gone incommunicado for the past two weeks. In light of her fears over their relationship, Ellie’s grandmother’s journal is proving to be an intriguing distraction. Ellie has a unique ability to access memories from scents while providing extraordinary aromatherapy advice, and her grandmother’s garden journal seems to be transforming and communicating with her. This would seem more unusual were the rest of her friends not also gifted with their own inexplicable talents, from the librarian who provides answers before the question is asked to those who wordlessly communicate with animals. As the author of numerous cozy mystery series written under the names Bailey Cattrell, Bailey Cates, and Cricket McRae, it should be no surprise that she has the ability to create engaging characters who inhabit delightful settings. What is remarkable is how the author continues to craft plots that are compelling, original, and unpredictable. Suspicion continues to fall on an assortment of very likely culprits, and while the reveal is logical few will see it coming. The blend of the mystical is subtle, with floriography, the language of flowers, falling as much into the realm of science as magic. As intriguing as the murder mystery is the development of the romantic relationships of both Ellie and her brother. Each has come to realize that their future paths may not be the same as their partners, so the real question is as to whether love is worth making a change. The characters are all so likable, and readers so enchanted by Ellie’s fairy-suitable garden, that they will be hopeful that Ellie and her loved ones make the right choices for their future Poppyville home. After her Granny Reid once again gets hauled into San Carmelita’s jail for disputing with her trailer park meth-lab neighbors, it seems like the perfect time for Savannah Reid to get her family out town on a working vacation. One of Savannah’s favorite mystery authors has been receiving threatening letters, so Natasha Van Cleef is hiring the Moonlight Magnolia Detective Agency to protect her while she embarks on an all-expense-paid mystery-themed cruise to Alaska. Along with her best friends John Gibson and Ryan Stone, Savannah is joined by her police Sergeant husband Dirk Coulter, his recently discovered biological parents, Savannah’s brother Waycross, and the extremely pregnant, about-to-pop Tammy Hart. While they initially luxuriate in the unlimited buffets and amenities, another written threat to Natasha signals that they have been accompanied by her stalker. When Natasha and her husband secretly disembark from the ship in Alaska only to perish in a fiery crash, Savannah blames herself and is determined to prove that the couple was murdered. 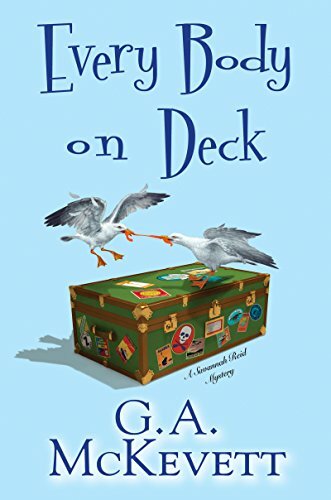 Savannah may be a born-and-bred Southern belle, but that won’t stop her from butting heads with ship security or investigating the lives of those closest to the author. While Natasha was a successful and admired writer, rumors swirled that her husband was a cheating embezzler and her inept assistant the suspected co-cheater. The presence of a Los Angeles leg-breaker throws in yet another possible culprit, but when the Moonlight Magnolia team becomes a little too efficient and aggressive with their tactics, the publicity-shy cruise line offers them a long-term stay in beautiful, sparsely populated rural Alaska. Following the lives of the Moonlight Magnolia Detective Agents is always a delight, now more than ever since it has incorporated more of the Reid family. Sharp-as-a-whip Granny and Waycross represent the sanest representatives of her numerous relatives, and they provide Savannah with the most emotional support and down home wisdom. Savannah and Dirk may be adjusting well to their new married life, but Waycross and Tammy seem to be facing their own star-crossed troubles. One of the strongest elements of the novel is how it succeeds in throwing in a twist that should completely surprise those readers who thought that they had the plot figured out. The characters of this twenty-second in the series remain as fresh and entertaining as when they first appeared in 1995, and the love they share for one another is obvious through their teasing, sharp banter, and good-intentioned meddling. Twenty-eight year-old Kailyn Wilde comes from a long line of strong, self-sufficient women. She is descended from an even older lineage of the practioners of magick, but Kailyn never thought that she would so soon become the owner of her family’s mystical store of potions, lotions, and healing creams. The sudden death of both her grandmother and mother left Abracadabra in Kailyn’s care, and she would have found the task and grief overwhelming if not for the fact that their presences continually pop to provide opinions, advice, and their afterlife’s ongoing mother-daughter bickering. It was in fact Kailyn and her muumuu-wearing psychic Aunt Tilly’s trip to their attorney’s office to discuss their family’s legal matters that leads to the horrific discovery of Jim Harkens, shot to death in his office. Although recent disturbances in her family’s magickal mojo-force have their abilities going a little wonky, Kailyn’s love of mysteries and Nancy Drew compel her to investigate and help her widowed friend. Evidence seems a little too conveniently pointed towards Elise Harkens as a vengeful wife, and Kailyn is unable to accept that her former babysitter could have ever committed murder. Gifted with her somewhat-deceased mother’s potions and her own telekinetic powers, Kailyn decides that it’s time to summon her own familiar; this despite the Wilde women’s previous attempts that resulted in five cute but non-magickal house cats. Instead of the wished for canine though, Kailyn finds in Abracadabra’s basement a bewildered, but very intrigued, elderly man calling himself Merlin. It is in fact the legendary wizard who has been summoned to New Camel, New York, from across the seas and through 1500 hundred years, and reigning in his impressive attempts to “help” Kailyn and Aunt Tilly will keep them as busy as discovering which of Jim Harken’s clients felt betrayed by the attorney. This will have Kailyn combining forces with the stunningly attractive local reporter Travis Anderson, who may not believe in magick but certainly is enchanted with Kailyn’s charm. This debut series by the author of the A Portrait in Crime mysteries introduces an undaunted and focused new heroine, who blends her love of detection with her talent for magick. Kailyn barely hesitates before violating a few ethical rules when delving into legal files, but she is very stringent regarding the practice of black, white, and even gray magick. The paranormal element grows stronger with Merlin’s delightful appearance, as he has no inhibitions against using his spells for retribution or to coerce information. The relationships between the Wilde women is as fun and complicated as one would expect between mothers and daughters, not all of whom are still among the living. The whimsical use of magick spurs along a surprisingly complex mundane mystery, and the promise of romance and further exploration of the origins of New Camel will give readers even more to look forward to with the next appearance of Abracadabra and its wares. 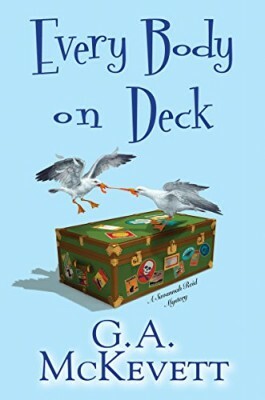 Leona London moved to Blue Lake, Indiana, to work for author Camilla Graham. She even gets to live in Camilla’s house. For Leona, it’s a dream come true. It got even better after she met a neighbor, Sam West. Unfortunately, Sam’s estranged wife disappeared, and by many, is presumed dead—and most of those people think Sam killed her. Leona is determined to prove Sam’s innocence and has found a couple of good clues. As townspeople warm to the idea he’s not a killer, tragedy strikes. Taylor Brand is a blogger and a friend of Sam’s absent wife. She’s been vocal about what she thought his involvement was and now wants to apologize in person. It puts Sam back on the killer/not killer list when her body is found on his property, having fallen from a bluff—or was she pushed? Leona has the misfortune to find the body. Luckily, this time, police chief Doug believes Sam is innocent. Camilla, Leona, Doug, and Sam set out to prove it. Of course being back in the news means paparazzi everywhere. Reporters follow Leona, shouting questions, taking photos. They even show up at Camilla’s house. One reporter does convince Sam it’s best to get his side of the story to the public rather than look like he’s hiding the truth. In the meantime, the hunt for Sam’s wife continues with better leads and federal agencies involved. Camilla and Leona manage to work on the next book while waiting, although it’s hard to concentrate on anything. A helpful research librarian provides not only a fresh set of eyes on Sam’s problem, but she’s also a potential girlfriend for Doug. As reports come in from around the globe, the local mystery remains a puzzle although the suspect pool grows. In the middle of the mayhem, Leona and Sam finally make their relationship public. Camilla and Leona make a good team, working on the book and on the puzzles in their own lives. Camilla has a potential love interest, too. The characters are people you’d like to meet, the town a great place to live (if you like snow). The dogs need more time on the pages! The plot and subplot never get tangled but leave readers wanting more. Be warned, just when you think you have it all figured out, Buckley manages to pull the rug from under your feet with a twisty surprise. This is the second book in the Writer’s Apprentice mystery series. Buckley also writes the Undercover Dish series. There are two books in each—so far. To enter to win a copy of all 4 books, simply email KRL at krlcontests@gmail[dot]com by replacing the [dot] with a period, and with the subject line “new may,” or comment on this article. A winner will be chosen June 3, 2017. U.S. residents only. If entering via email please include your mailing address, and if via comment please include your email address. I love the clever titles and cute covers! Thanks! What a true reader’s treasure — thanks for offering them to us! I appreciate twisty surprises in a book, these sound awesome! Thanks for the chance. Those are 4 good mysteries for reading while reclining around the pool. Love the covers, it’s always a plus if there are animals on the cover, especially cats. Thank you for the opportunity. Winning these would make for some good reading in June! Thanks for a chance to win! Enjoyed your reviews very much. Thanks for the chance to win these books by authors I have read & enjoyed. These all look like great reads. Thanks for the opportunity to win. I will definitely put all these on my TBR list. Would love to read these 4 books! Thanks for the chance!!! Great way to start off the summer with these wonderful books. Thanks for the chance to win! salvatoresmom71 (at) yahoo (dot) com.. These are my kind of books! They all sounds like such great reads this summer! What a great selection of new cozies. They look like wonderful reads for the summer. All look and sounds intriguing. I want to read all four of these books! A great selection from four awesome authors, thanks for the chance. 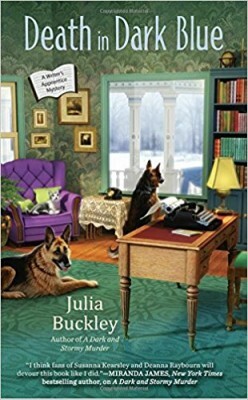 Some great new cozy mysteries! My TBR list keeps getting longer and longer. Thank you for a chance to win! Have a great week. I love your “new May” books–I already follow a couple of those authors, and the other two look great! Fingers crossed! McKevett is the only author I’ve read before but they all sound wonderful!! Some fabulous authors mentioned here with some great sounding books. Thank you for the chance to win. I go through so many winners each week I never have the time to post the names sorry-but the winners are contacted via email.